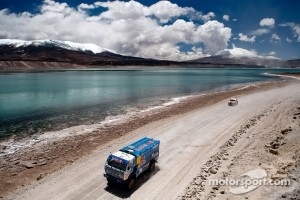 Snow in the Andes cancels sixth stage; Kamaz-Master #500 has been excluded! 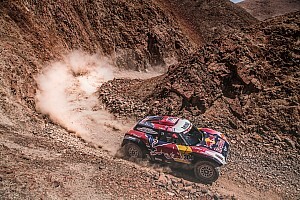 The Dakar competitors awoke this morning to discover that wintry weather conditions have forced the organizers, Amaury Sport Organisation (ASO), to cancel the sixth stage of the 2012 Dakar edition. It is not the first time that a stage had to be tossed out – one year during the trek across Africa, high winds with blowing sand made it impossible to continue safely. The Andes Mountain range has recently had a lot of rain in the lower to mid elevations and now the addition of snow with icy conditions has forced the Chilean authorities to close all roads in the area last night. 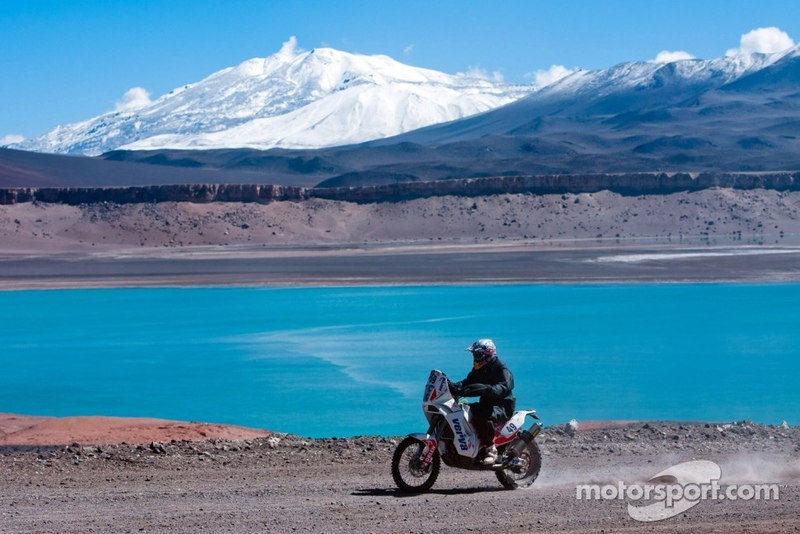 While the riders and drivers were still getting rest, the Paso de San Francisco pass at 4000+ meters is where the crossing border between Argentina and Chile would have taken place. For the safety of the competitors and their service vehicles and crews, the press corps, and the spectators who follow the rally-raid, the ASO, have elected to cancel today’s stage and setup a convoy. The original route was from Fiambala, Argentina to Copiapo, Chile. The route would have been a 641km trek which included a 247km special stage. Instead they took off in a convoy to arrive in Copiapo but first they had to head North before turning South to reach their final destination. At the time of this story, the Bike convoy has crossed the border into Chile and is currently in Diego de Almagro. The Car, Quad and Truck classes will follow the same route. The riders can trade off the lead but thus far defending champion Marc Coma has been up front. While it does not matter who leads the group, what matters is they all hope that there are no obstacles along the way; including any failures to their racing machines. "The cancellation of the stage does not benefit you, because it means that there will be 250 km less and so less possibilities to recover time. Anything that means less kilometres and the race being less complicated is worse for me," said Coma. 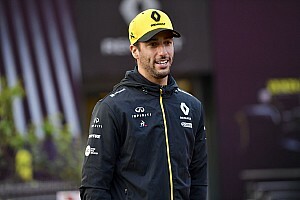 "What I need is a difficult race, with many competitive kilometres and then I will have to do them well, but if we don't have that chance, it will be very difficult". The other breaking news came late last night when the Dakar officials decided to exclude from the competition the #500 Kamaz of Eduard Nikolaev, Sergey Savostin and Vladimir Rybakov. The reason stated was “unsportsmanlike conduct” which is listed in the rule book as article 29 P. CSI chapter XI art 151 C. The incident took place on the fourth stage. The officials did not take this lightly and spent time going over the facts which is why it was not announced. What is now known is the incident was between the #500 Truck and the #410 Car belonging to the Argentinean SF Competicion team with driver Marcos di Palma and his co-pilot Jose Luis di Palma; both from Argentina. However it is unclear to exactly what took place but the Kamaz team is not happy with the decision. One of the Russian team members was injured during the incident. 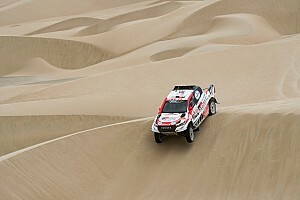 The Kamaz young guns have not had an easy rally this year after the top two Russian drivers retired. Over the past 11 Dakar events, Vladimir Chagin and Firdaus Kabirov notched nine Dakar Truck victories with Chagin earning seven titles and his first one was in 2000 [2008 Dakar was canceled]. 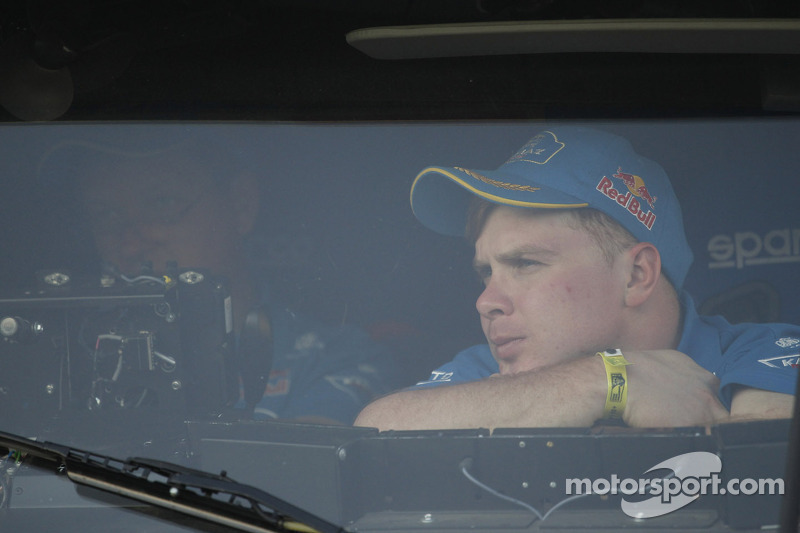 Nikolaev and his co-pilots were the top Kamaz team and were listed after stage five was completed in fifth and at that time they were over 22 minutes behind leader Gerard de Rooy’s Iveco. As of today, the Withdrawal list has been change to indicate that the #500 Truck shows “expulsion”. The Kamaz-Master team has not made an official statement at this time. Tomorrow the contest will see action again which will be a loop of Copiapó. 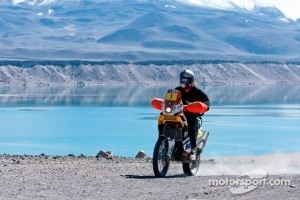 They will have a 154 km route to travel in the Atacama region of Chile before the 419 km special stage. Due to the recent rain in the area, it might not be as dry as expected but it will not be an easy challenge and the longest one since the start of this year's Dakar. The contenders will face the desert sandy trails, will take on sand dunes plus perhaps a bit of fog so it will not be an easy stage.